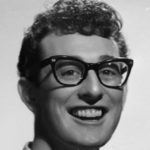 Charles Hardin Holley known as Buddy Holly, was an American musician and singer-songwriter who was a central figure of mid-1950’s rock and roll. He was born in Lubbock, Texas, to a musical family during the Great Depression, and learned to play guitar and sing alongside his siblings. His style was influenced by gospel music, country music, and rhythm and blues acts, and he performed in Lubbock with his friends from high school. He made his first appearance on local television in 1952, and the following year he formed the group “Buddy and Bob” with his friend Bob Montgomery. "I’m not trying to stump anybody… it’s the beauty of the language that I’m interested in."